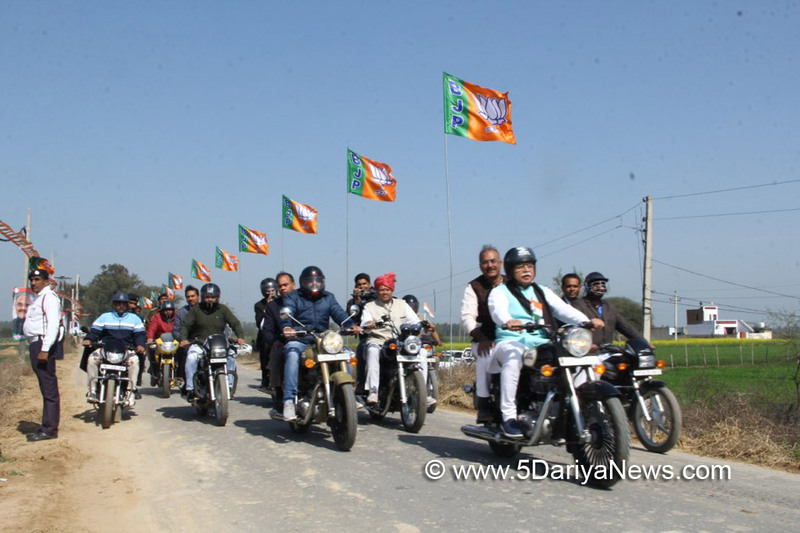 Haryana Chief Minister Manohar Lal Khattar on Wednesday drove a motorcycle to take stock of preparations for "Yuva Hunkar Rally" to be addressed by BJP national president Amit Shah in Jind town of Haryana on Thursday.The ruling Bharatiya Janata Party (BJP) in the state has plans to have supporters and youth coming for the rally on over one lakh motorcycles.The Chief Minister rode the motorcycle from the helipad where he had landed, to the venue of rally. He was accompanied by Agriculture and Farmers' Welfare Minister O.P. Dhankar and others.The rally by the BJP president is being seen in political circles in Haryana as the BJP's launch of campaign for the assembly elections.Hundreds of security personnel, including Haryana Police and para-military forces, have been stationed in Jind, over 200 km from here, ahead of Shah's rally in view of the threat by opposition Indian National Lok Dal (INLD) that its workers would show black flags to the BJP chief and protest against his rally.The opposition Congress is also opposing the BJP's motorcycle rally. Agitating Jat community leaders, under the All-India Jat Andolan Sangharsh Samiti (AIJASS), had earlier threatened to disrupt the BJP rally but later decided against it on Sunday following talks with the state government.The Khattar government has reportedly agreed to most of their demands, including taking steps to give reservation in jobs to Jats and withdrawal of cases against protesters, who indulged in violence and arson during the Jat agitation in February 2016.Para-military forces and Haryana Police personnel have also been deputed in several districts adjoining Jind district, as thousands of BJP supporters will be riding motorcycles towards Jind town.Interacting with the media after taking stock of preparations for the rally, Khattar said the visit of Amit Shah would be "historic and one-of-its-kind in which lakhs of people would come on their motorcycles to participate".Asked about the opposition parties criticising the rally, Khattar said the opposition leaders should not stoop to this level to oppose a political rally.